Talk to me about swine and I will swoon. Shamelessly biased about my love for the hog, I get excited when I hear about dishes made with it. So when Meat the Porkers came on board the culinary scene in November last year, it was big news. Well truth be told, of course it would be big news. Never in our Indian culinary scene have we had a porky Indian restaurant or even porky Indian dishes. In fact, I would daresay it’s probably a first in Asia! Owner Herukh Jethwani, you would know him from Fierce Curry House, has been tossing his idea of taking Indian cuisine to new heights for years. Despite the unknown, he and his missus was ready to introduce porky Indian delights to our culinary scene, taking the swine into limelight in his heritage cuisine. After toying the idea for a while, it turned out harder than he thought. Not having the knowledge in the other white meat, he had to really go through a lot but he finally made it. Even then, Herukh tested his porky creations from takeaway orders from his home too. Meat the Porkers finally opened and the rest they say is history. Located in Publika area, the restaurant has a minimalist industrial vibe that exudes much casualness. Colorful boxy shelves with cute hogs reminded us again what we were here for. Opt for dining in the main dining area or simply al fresco. For starters, there’s Pork Pakora (RM20). Yep, you heard me… not onion pakora, not vegetable pakora but Pork Pakora served with mint chutney. These crispy nuggets of porky bits with spices and aromatics tasted so moreish, you’ll want a bucket of these. Oh wait, that’s me that wants the bucket… it’s that good! Then there’s Pork Seekh Kebab (RM28). Moist and tender, these kebab pieces are very tasty with all the spices and herbs. Served with mint chutney too, I personally didn’t think it needed it as it was already so tasty. When the Tandoori Pork Ribs (RM48) landed on our table, there was certainly a lot of oohs and aahs in amazement. The sight of glorious meaty pork ribs basted in the classic reddish tandoori marinade and chargrilled in a tandoor oven had everyone at the table salivating. Don’t know how we managed to resist not attacking the ribs but rather let our camera and phone eat first was a definitely a mystery to us. The ribs is picture perfect with all its colors. Then the star of the menu showed up. Siew Yoke Biryani (RM28), hidden in the usual biryani bowl and seal with dough to keep in the aroma and flavours. The roasted pork biryani comes with sides of curry sauce, yoghurt sauce, pol sambal and pork cracklings. I am super glad the pork crackling is served on the side because this means that it will be crispy. When the lid came off, we were hit with a wonderful aroma of spices. The biryani long grain rice was fluffy with beautiful yellow hue providing the base for fried shallots and coriander. We dug in and low behold, generous chunks of roasted pork were unveiled. I can’t believe no one has ever thought to come up with this sooner. What a treat! The flavours of the biryani and the roasted pork with cracklings are superb. The rice was beautifully fluffy, aromatic and well flavoured with spices. The roasted pork was tender and tasty too. The combination of both was lethally yummy. As I look around, every table had at least an order of this dish. Damn shiok! Although the Siew Yoke Biryani hog the limelight, the hogging didn’t stop there. Butter Pork (RM28), a piggy take on the much beloved butter chicken was sublime. His other restaurant already perfected the butter chicken and now it’s made with tenderloin pork fillet. Thick, lusciously rich and creamy with a nice tang of tomato flavours, the Butter Pork goes so well with rice or bread. There’s also a porky rendition of another classic in Pork 65 Masala (RM28). Bold spice flavours with punchy heat from tenderloin pieces of pork are guaranteed to go well with rice or bread for that matter. The tiny mustard seeds added touches of popping flavours and texture to the dish. After all that meat, we consoled our health conscience with an order of Eggplant Masala (RM17). Eggplant cooked till soft and creamy with lots of aromatics and spices, the dish was a big hit on the table. Then, there’s also Tadka Dal (RM17), a must-order when dining on the cuisine. The version here is damn delicious. Thick, creamy, nutty and well infused with spices, dried chilies and fresh herbs, I kept piling this on my rice. We enjoyed how Meat the Porkers aim to please us swine fans. It took a huge gamble and has gone where no man has been and the gamble certainly paid off. Meat the Porkers may be the first porky Indian restaurant to hit our shores but I am sure it won’t be for long before many will follow pursuit. Herukh plans to introduce other new dishes every 6 months so expect more porky delights like Pork Rib Biryani to come. 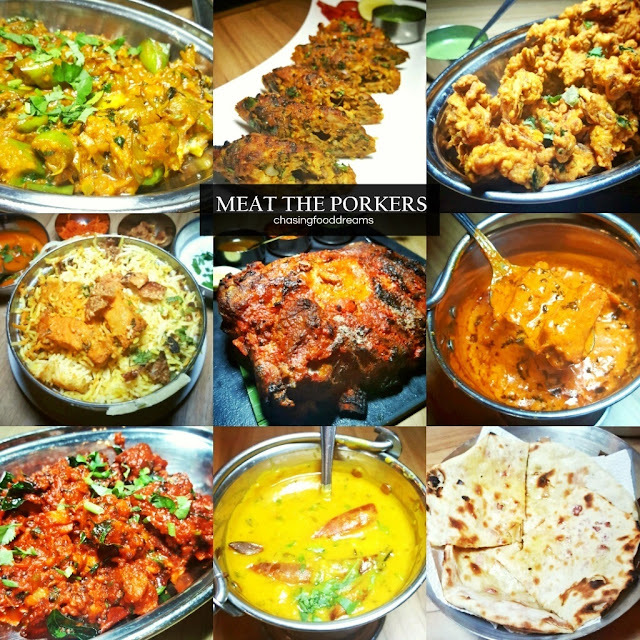 When food is this good and made even better with swine, Meat the Porkers is a must-visit!! Wed to Mon 12noon - 3.30pm | 6.30pm-10pm (last order 9.45pm). Such a mouth watering dishes they are, thanks for sharing.